After the marine experience of tuna tartar [link], let’s get back again to mainland to enjoy the second starter of our menu. 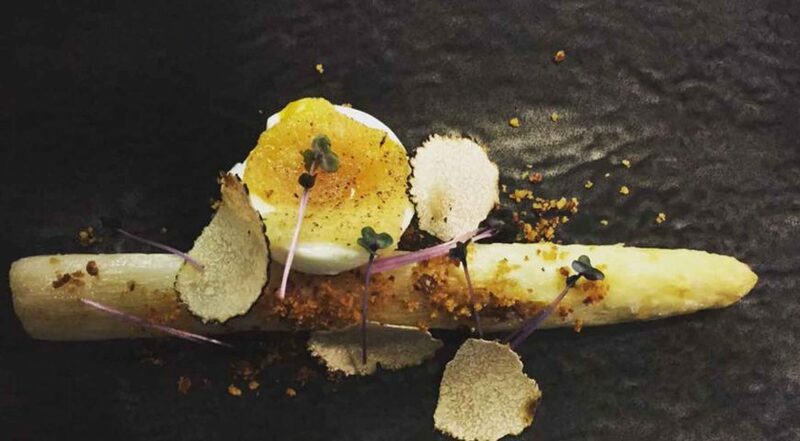 White Asparagus with Chorizo Crumble Summer Truffle is a delicious creation of our chef that blends the spicy and hot taste of Chorizo, the mild and sophisticated flavour of white asparagus and the unique fragrances of truffles all together. The result is a well-structured and appetizing starter that works as a delicious break between the fishy savours of tuna tartar and Hokkaido Uni Pasta[link], the first of our scheduled first courses. Chorizo is a traditional paprika flavoured Spanish sausage made from pork or beef. Paprika gives Chorizo its characteristic vivid colour and its hot, spiced taste. In Italy, it is possible to find a variant of Chorizo, the so called “salsiccia napoletana”, that is quite similar. Crumble comes from Britain, where it is quite popular. In Takada, we flavour crumble with summer truffle, a typical Italian and French cuisine fragrance. Summer truffle is the mildest variety of truffles; by adding to this starter its spicy and unique flavour, it changes the coarse Chorizo into something decisively more sophisticated.